A recent incident in Wallingford, Connecticut, not far from where I grew up, caused VDARE.com Editor Peter Brimelow to comment: “Cultural Marxist totalitarianism is coming to an America near you.” A complaint was lodged with the local police that “hate” merchandise— Nazi and Confederate memorabilia—was being publicly exhibited and sold at a popular flea market. Following a police investigation, an Anti-Defamation League official named Joshua Sayles expressed the view that “It’s unfortunate that under the law people have the right to sell these things; but it doesn’t mean they should sell these things. It’s not a crime but I would call it hate…”[Wallingford police look into complaint about Nazi, Confederate items sold at flea market, by Mary Ellen Godin, Record-Journal, July 10, 2015]. Peter properly suggests if such hate-inspectors get their way, we will be living in a condition of almost Stalinist oppression. We might not be shipped off to gulags(yet), but the control of speech and thought that these professional sensitizers would impose would be reminiscent of the worst examples of Leftist tyranny. I say “Leftist” intentionally—because rightist or non-leftist regimes have never tried to control their subjects’ minds as systematically as the Left. Even Adolf Hitler’ s Nazi regime largely lost interest in mind reconstruction. It closed up universities as an unnecessary expense by the early 1940s, left the economy in private hands except for those businesses it expropriated, and tolerated a surprisingly wide range of intellectual dissenters. Of course, this had nothing to do with being nice. It was simply that the Nazis, aggressive thugs as they were, had no interest in the worldwide indoctrination program dreamed of by the universalist, conversionary and egalitarian zealots of the true Left. In contrast to the Nazis, the Left has regularly used every means at its disposal to reconstruct the human personality in accordance with its world vision. Perhaps even more significantly, for the last seventy years the Left has imagined itself as a brave force of resistance against a supposedly implacable but entirely fictitious and shape-shifting enemy— the great evil of “fascism.” As I document in my forthcoming book, Fascism: Career of a Concept, the Left’s eternal enemy of “fascism” is variously depicted as racism, Christian fanaticism, European nationalism, or even opposition to Israeli foreign policy. Curiously, the post-war Italian fascist Movimento Sociale Italiano was fervently pro-Israel as well as pro-NATO. But Jewish “antifascists” can’t be bothered by such details. The popular concept of fascism also identifies all forms of the European-wide fascist movement with Hitler, who was actually influenced far more by Stalinist totalitarianism than Mussolini’s ramshackle, not particularly repressive government. “Fascist” is arbitrarily equated with both Nazi genocide a nd anything the cultural Left disapproves of at the moment. Cultural Marxism‘s central teachings go back genealogically to the Institute for Social Research in interwar Germany. Theodor Adorno, Max Horkheimer and their radical Leftist colleagues attempted to fuse Marxist economics and Freudian psychology into a critique of bourgeois society. The synthesized result had less to do with serious Marxism than with attacking “repressive” and “patriarchal” family life and offering utopian alternatives. A major aspect of this emerging self-described “Critical Theory,” particularly after the rise of Nazism and the transfer of the Frankfurt School to the US, was describing and combatting “fascism.” This mission became integral to Critical Theory, together with a continuing crusade against anti-Semitism, which, by a certain internal logic, always accompanied the supposed fascist threat. Since the Frankfurt school theorists were mostly Jewish leftists, these facile associations suited them and their followers rather well. 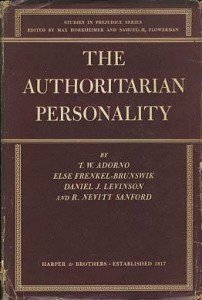 These psychic and social dangers were described by Horkheimer, Adorno, and others in their massive anthology The Authoritarian Personality, commissioned by the American Jewish Committee after the Second World War and published in 1950, as part of a much larger “Studies in Prejudice” project. [American Jewish Committee News, March 15, 1950.] 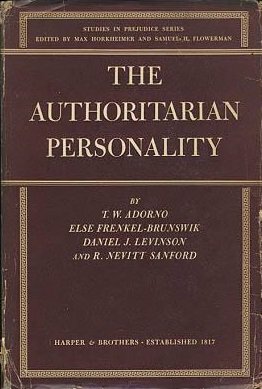 While in the US, Adorno also created the F-Scale (F for “Fascist”) in social psychology testing, supposed to determine someone’s degree of propensity to subscribe to the hated ideology. It’s important to remember Critical Theory isn’t a weapon of revolution. It’s a weapon of repression. And it was quickly and thoroughly Americanized. It’s ridiculous to treat it as an exotic import: it took root in American society and culture almost immediately after it was introduced. Critical Theorists not only found a congenial home in the US, but some were even sent back to “reeducate” the Germans, who had been supposedly corrupted by their “authoritarian” families and “pseudo-democratic” experiences. Although the Critical Theorists were mostly soft on the Communists, Cold War liberals like Seymour Martin Lipset and other contributors to Commentarystressed the usability of the Frankfurt School’s form of analysis for investigating all enemies of “liberal democracy,” including the Soviets. The Soviet enemy, in this analysis, were defenders of patriarchal repression and “authoritarian personalities” that stood in the way of democratic progress. Lipset was also concerned about “working class authoritarianism,” a focus very much present in the work of Adorno and Horkheimer [Political Man, by Seymour Martin Lipset, by Andrew Hacker, Commentary, June 1, 2015]. Communists, fascists and all the benighted simpletons toiling in factories potentially opposed American pluralism. Since we were engaged in a struggle to preserve our democratic, pluralist identity, we also had to be sure that young Americans were instilled with the proper attitudes about tolerance and equality. One can find in the call for war against “un-American” prejudice beginning in the 1950s the tendency toward Leftist totalitarianism. One major change since then: the number and variety of supposed victims of “prejudice” continue to grow, together with the repressive measures that must be taken to intimidate possible dissenters. There has also been a collapse in effective opposition to the Leftist Social Justice Warriors. Recent events in the South indicate even many descendants of Confederate soldiers are unwilling to defend their ancestral heritage against hysterical detractors. The cultural Left, and no other political force, can put gigantic, screaming crowds into the streets in any American city on the spur of the moment. The official Right, by contrast, stays home watching Fox News. In the absence of real opposition, the cultural-social Left is free to bully and lie as much as it wants. Media-empowered anti-anti-Semites, like ADL officials, freely equate the Confederacy with the perpetrators of the Holocaust, treating both as violent haters and sources of hate for later generations. Our bogus Conservative Establishment happily rallies to Leftist social positions. No one on the Left sounds as unhinged as “conservative” journalists like Max Boot [Furling the Confederate flag is just the start, Commentary, June 22, 2015]. Or for that matter, Jeff Jacoby [The Confederate flag is anti-American, Boston Globe,July 9, 2015]. Republican congressmen and governors have been at least as zealous as their supposedly more Leftist opposition in calling for the obliteration of Confederate symbols and names. One also discovers from the Beltway Right press that homosexual rights, including homosexual marriage, is a basic Western value and that European leaders like Victor Orban and Vladimir Putin don’t really belong to the West because they don’t welcome gay activists into the political and educational process [The Authentic Right vs. The Neocons, by Ilana Mercer, WND, December 21, 2007]. Even the relatively isolated, belated complaints of Donald Trump about the crime caused by Third World immigration have elicited frenzied attacks on bigotry from such GOP stalwarts as Linda Chavez and Jeb Bush [Trumped Up, Townhall, July 10, 2015]. Chavez, we might note, has taken valuable time out from bashing the Confederate Battle Flag to deal with the anti-immigration bigots on the right [Linda Chavez: No defending the indefensible, Daily Local News, June 28, 2015]. The Cultural Marxist threat isn’t an epidemic coming from outside: It is raging among our make-believe conservatives, who now often sound as radical as the Frankfurt School. The critical difference, or so I’ve been told, is that our politicians are usually not self-described socialists, whereas the Critical Theorists were. But even that distinction may no longer be important. Our government and that of other Western countries has grown enormously and now interferes in our social and commercial life far more than it did eighty years ago. Moreover, the major thrust of Cultural Marxism has never been toward the nationalization of productive forces and other classical socialist schemes. It has always been cultural—toward the smashing of bourgeois values, Christian families, gender roles, and what was viewed as a repressive political culture. Government control of the economy was merely an instrument for moving toward the social-cultural goal that the Frankfurt School set for us. And the social goals of Cultural Marxism are portrayed as the only alternative to a dark night of “fascism” that the ADL, the SPLC, and other like organizations are ostensibly protecting us from. Yet the specter is never banished. The “Far Right” threat always remains. And as an ever greater number of people find themselves marginalized as “haters,” the actual tyranny taking shape in America could indeed be something even worse than the fevered “fascist” nightmares of the Left’s imagination. Dr. Paul Gottfried is IAI’s Distinguished Senior Fellow in Western Civilization and the History of Ideas. This article was oiginally published at Vdare.com on July 21, 2015. The opinions published here are those of the writer and are not necessarily endorsed by the Institute. A Brief History of Male Chauvinism Anti-Marxist Revolution in Brazil?